The word Ajax comes from an odd mixture of the words Edax and Java. Indeed, Ajax may be considered as the little brother of Edax, a program I designed in C language and which was awarded as the French 2000 Champion Othello program. Ajax is a light Edax; nonetheless, most of the same recipes were applied to it. Consequently, Ajax is a strong software, probably the strongest Java applet; although it is much weaker than Edax and other similar software. With Ajax I hope filling a gap: rareness of actually strong applets in the Web, for I am myself, as a weak player, able to beat most of them. I also try to offer a user interface of high quality and easy to use. This page contains a brief description of the main display and of the menu. 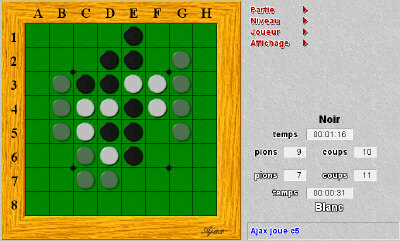 On the left, the Othello board, with a classic look, where the game is displayed. On the top right, a menu to control the game. On the very bottom right , a banner displays information about the game advancement: last played move or final score. Occasionnally, on the right center, a button indicates that a player must pass its turn. Click on it to keep playing. New Game. Start a new game. Undo. Undo your last move. Hint. Ask Ajax the move it is expecting from you. Dummy. The computer plays randomly. Beginnner. The computer plays at a weak level. Amateur. The computer plays at an intermediate level. Expert. The computer plays at a strong level. Master. The computer plays at a very strong level. Blitz. The computer plays the whole game in 5 minutes. Tournament. The computer plays the whole game in 25 minutes. Swap colors. Play with Black or White. Legal moves. Show where the player can move. Animation. Show the discs flipping. Temporization. Blink played discs and wait a few seconds between moves.